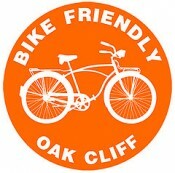 The bicycle love continues to grow in Oak Cliff! Oak Cliff Cargo Bicycles, started by Jonathan Braddick and Brennan Bechtol is a new startup company spurred on by the cargo bike workshop BFOC put on as part of Cyclesomatic 2012. Oak Cliff Cargo Bicycles will be offering custom utilitarian cargo bikes to the masses. Get ready to leave the car at home next time you’re taking the tots to the park or off for groceries. OCCB is currently running a survey to gauge the market. Take the quick survey and be entered to win a sweet Burn helmet, and Like their page to also win a prize if you’re the 100th Like. One prize per person.